I can't believe I'm saying this, but Christmas is right around the corner!! The past few months have flown by. I absolutely love the holidays and am looking forward to Thanksgiving this week and then the start of the EVERYTHING Christmas! Over the next few weeks I'll be doing holiday gift guides to help make your shopping a little easier. Today's gift guide is for the gals in your life! Happy shopping and comment below if you have any questions! These eye shadows are GORGEOUS and such a good beauty gift! A leopard clutch is the perfect accessory to any outfit. This fun Christmas candle is half off! I LOVE Stila liquid lipstick and 3 for $20 is such a good deal. These red earrings are so pretty for the holidays! I bought this necklace during the #nsale and I literally wear it daily. It's my favorite necklace and would make such a nice gift! I think this sweater is so pretty! GAP clothing is great quality. Everyone loves a cozy plaid scarf! Old Navy has so many cute ones and really good sales right now. This scarf comes in a bunch of colors. These look really warm and come in a few colors...and bonus, you can use your phone without having to take them off! YES. This mug is so cute and makes a nice personalized gift! 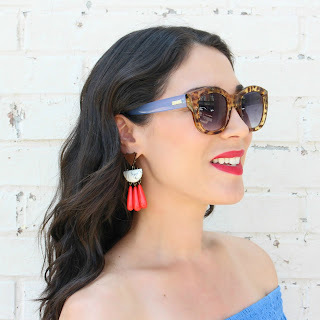 These are super cute and way less expensive than the popular Baublebar ones! I had to add another Old Navy scarf to the list...the prices are SO good! My friends birthday is coming this weekend and I was wondering what to give her this winter! Thank you for this awsome collection. I love it! !